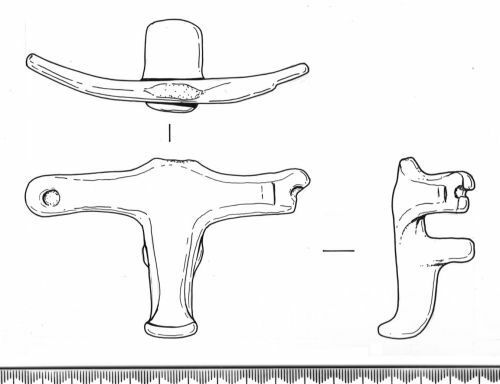 Separate copper-alloy leg from a round, probably cylindrical, vessel. The leg was attached by means of two horizontal arms which curve around the side of the vessel; each ends in a rounded end pierced for a rivet. One end is slightly flattened, and broken through the hole; the other is not flattened, and the hole is blocked with a hard dark material, perhaps iron corrosion. Where the two arms meet, the horizontal upper edge rises up slightly to a straight, perhaps now broken, edge (if it is broken, the break is very old and worn). Extending from the lower edge here is the leg itself, which tapers in width down to a small out-turned foot. On the reverse of the leg, just below the arms, is a horizontal projection on which the base of the vessel would have sat. There is no rivet hole or other means of fixing on this projection. Below, the leg is slightly thicker. No parallels have been found for this leg, but it is not medieval or post-medieval, and due to the large variety in vessel forms in the Roman period it is almost certainly of this date.